Barry Yarkon: I am the author of the Altair Computer Notes article that Bruce Damer, Curator of DigiBarn Computer Museum, describes on this website as possibly "...the first desktop publishing on a personal computer." Encouraging me to create this article, Bruce wrote, "... that early and to my mind seminal article. I for years was in desktop/visual publishing (1980s) and was surprised to find a micro driving typesetters years before any other system." So, this is the story of why Barry made his way from Manhattan to Albuquerque in 1975 and how he began using Altair systems and components in his phototypesetting service business. And how two guys with an elegant Z80 single-board microcomputer in 1978 somehow missed the wave. Looking back, it was a time of great fertility in what came to be known as the Personal Computer industry, but like that earlier cultural tipping point, Woodstock in 1969, those of us caught up in the beginning of it had no idea where it was headed. 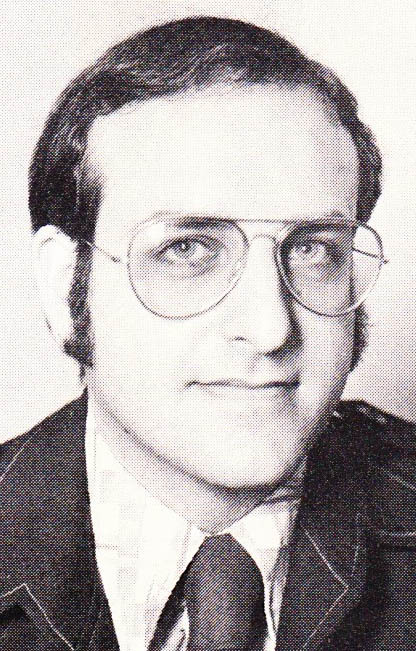 Figure A: Barry Yarkon, circa 1975 with sideburns and aviator-style glasses. 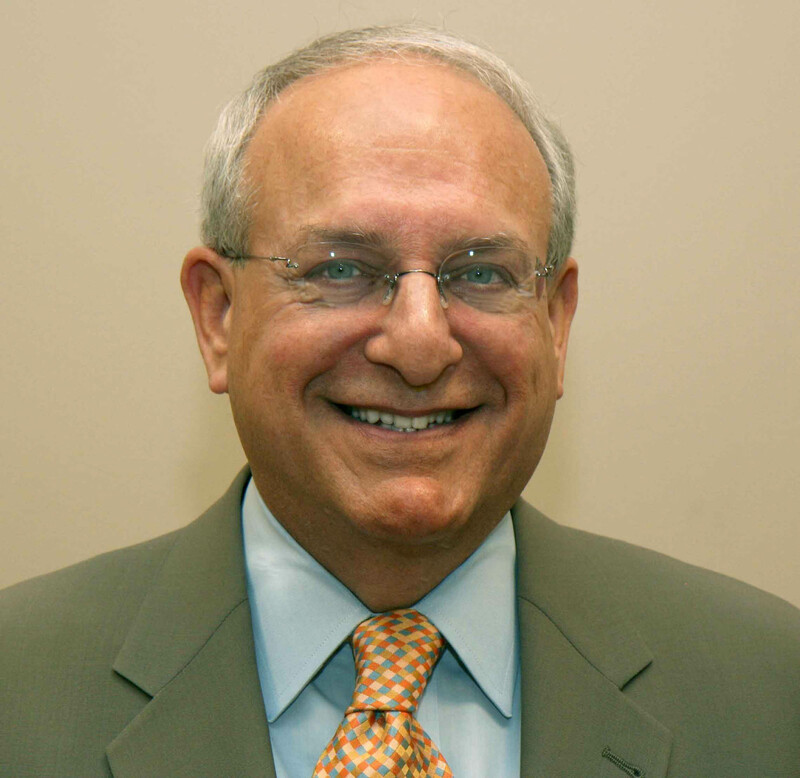 Figure B: Barry Yarkon, 2009 with grey hair and varilux glasses. In 1975 Barry was a partner in Graphicomposition, Inc., a six-person graphic design and typesetting service bureau in Times Square, NYC, and he was charged with implementing a computer-driven phototypesetting system. At the time there was an established typesetting industry that used mostly cast lead type and a few early film/photopaper machines in the graphic arts and newspaper fields. Ironically that craft-based industry was doomed to fade because of the gradual introduction of computers and composition applications that became known as Desktop Publishing. Graphicomposition's main typesetting device was the Photon Pacesetter MkI phototypesetter, an analog-digital step-and-repeat device whose stepping motors and solenoids and xenon flash tubes were controlled by a 16-bit digital controller, the Varisystems P-16 (Plainview, NY). 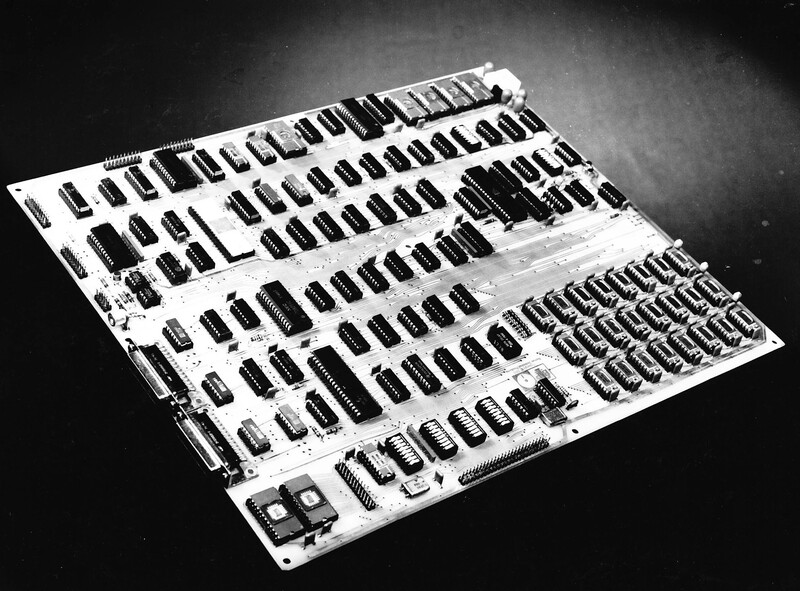 It used a socketed array of TTL logic ICs on a hinged wire-wrapped motherboard above a cabinet filled with connectors, cables, pots and power supplies. AC to DC conversion and signal shaping were rudimentary. Typefaces were negative character shapes arranged serially around the circumference of glass master discs that spun around at high speed as each character was exposed by a brief flash of light, and displaced along the line of type being set by a moving right-angled first-surface mirror system. By today's standards this sounds Rube Goldberg-like, but it was near state-of-the-art in 1975. In Graphicomposition's case, the output of the Pacesetter was a roll of exposed positive photographic paper containing columns of type, which needed to be developed. The input media of the time was 6 - 8 level punched paper tape, read into the controller via an optical tape reader. Galleys of type were developed, dried and pasted down on art boards to form "mechanicals" or pages. The mechanicals were hand-ruled in ink and combined with line drawings and velox halftone art pasted down with rubber cement - really! A major concern was the lack of cost effective and efficient input devices - this was a daily headache in production. 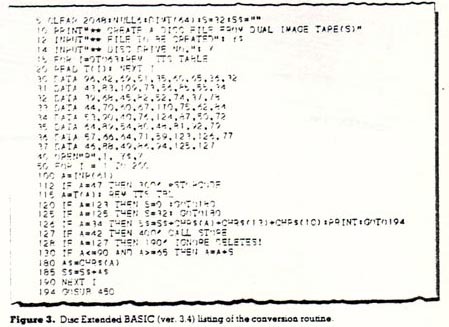 Graphicomposition had started, on a shoe-string budget, using a keyboard-send-receive teletype console to type into that punched paper tapes, but correcting errors in spelling or embedded machine instructions was a huge problem. Imagine using a hand splicing/punching device to correct the punched tapes. First Barry upgraded to Friden Flexowriters and then he replaced them with several Interface Mechanisms keyboard input devices which actually printed a series of vertical barcodes along a narrow ribbon of white paper, with human-readable characters below each barcode frame. This allowed the tapes to be edited more easily by cutting and taping sections of tape visually. However, Barry was still in need of a better solution. In January 1975, the MITS Altair 8800 personal computer was featured on the cover of Popular Electronics magazine. Barry had worked at Ziff-Davis across the hall from Popular Electronics Editorial so he called Les Solomon, PE's Technical Editor, to ask if it was "real". Les explained that his friend Ed Roberts had designed this as a kit around the 8080 microprocessor and he suggested that Barry stop off in Albuquerque during a business trip Barry had planned. Figure C. Barry Yarkon troubleshooting at Graphicomposition, Inc., circa 1976, using dual trace oscilloscope. Aside: The company Barry went to see in Orange County, CA, had developed the TransMedia 500, a machine that facilitated the conversion of early standalone word processing machines' diskettes from one format to another [these were IBM 3740 8-inch floppies formatted uniquely for each brand - IBM, Wang, Lanier, NBI, CPT among others]. And Barry was going to Houston to speak at the annual ANPA newspaper convention because of his involvement in the international Pacesetter Users Group and because of a two-day seminar he gave each month around the country for the Graphic Arts Technical Foundation entitled Minicomputer Programming for Composition. Barry actually did buy a TransMedia 500 which allowed his company to accept clients' word processor diskettes and several different computer diskettes to stream into Graphicomposition's typesetting system. It performed character conversions on the fly from tables that he could create. When Barry arrived at MITS in Albuquerque, Ed Roberts was not there. Instead his host for the day was David Bunnell, VP Marketing and a former technical writer at MITS. David was interested in publicizing any real world application of this new machine, so they struck a deal. In exchange for mentioning the Altair 8800 in the registration brochures for Barry's GATF seminars and for using it as his demo machine in major cities around the country and in Canada, David arranged to send him one of every new product MITS produced - as they were invented. Barry also met a young guy that day dressed in blue jeans and a plaid shirt with pocket protector who he was told was writing a BASIC language program that was to run on the Altair 8800, that guy's name was Bill Gates. Barry and David's friendship lasted for a number of years. Barry recalls David later visited him in New York. In exchange for all of the supplied hardware, Barry wrote about using the Altair 8800 and later the Altair 680 in his seminars and in his typesetting company. 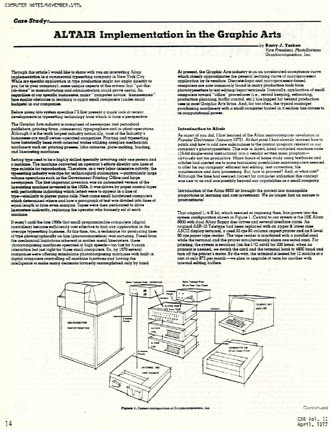 The Altair Computer Notes article, Altair Implementation in the Graphic Arts, was one of those writings. Barry believes he also did a hypothetical article about using the Altair and Disc Extended BASIC to automate the retail dispensing of pharmacy prescriptions. Of course Dave went on from MITS to become a prolific publisher of computer and other magazines, including: PC Magazine (1981), PC World, Macworld, Macworld Expo, New Media and BioWorld. David was awarded the only Lifetime Achievement Award by the Computer Press Association. 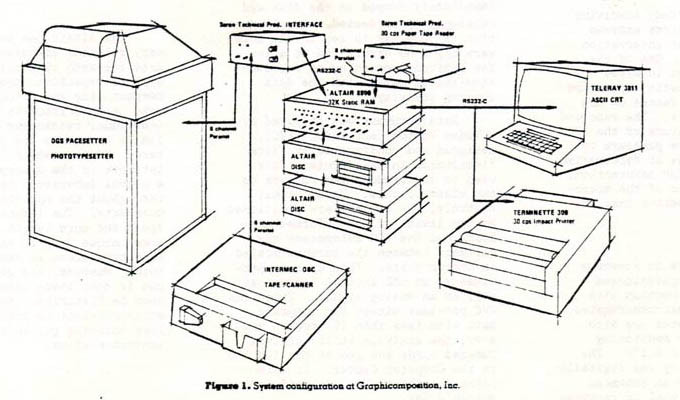 Figure 1 from article: System configuration at Graphicomposition, Inc.
By the time of that article, with David's help, Barry had already replaced MITS' dynamic RAM cards with static RAM, added parallel and serial port cards and the two 8-inch floppy diskette drives that you see in the article. Figure 1 was drawn by Barry's late cousin and partner at Graphicomposition, Norman Rothenberg. 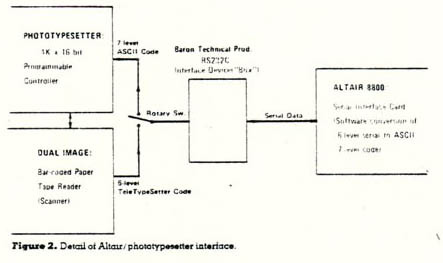 That illustration includes the Altair 8800, a Telray "dumb" terminal, an Intermec printed paper tape reader, a BTP/Remex punched paper tape reader, and a BTP A/B interface switch (Figure 2). Later Barry purchased a Wang 2100MVP minicomputer and interfaced that to the RS232C network as well. Programming for composition was done in Altair Disc Extended BASIC v.3.4 (see figure 3), which had machine level control as well as higher level commands. Barry was just happy not to be toggling the 16-bit switches on the Altair 8800's front panel - 4-bit opcode and 12-bit operand. Or loading punched paper tapes. Each person generating the typesetting needed to embed typographic command keystrokes in and around the text that were executed by the controller in the Pacesetter MkI - such as typefaces and type sizes, bold, italic, leader dots, tabs, line length and line endings, etc. Figure 4 is a showing of three sets of typeset galleys that were used in a series of book catalogs that Graphicomposition produced for Charles Davis, VP Marketing at Simon & Schuster at that time. The more comprehensive list on the left was then massaged in BASIC to produce the two differently sorted and formatted galleys to its right. This was a major boost in productivity and it seemed so advanced at the time (eight years before the Apple Macintosh was introduced in 1984). Later, the graphic capabilities of the Mac together with price reductions for proprietary WYSIWYG editing terminals (What You See Is What You Get) would sound the Death Knell for the typesetting industry. 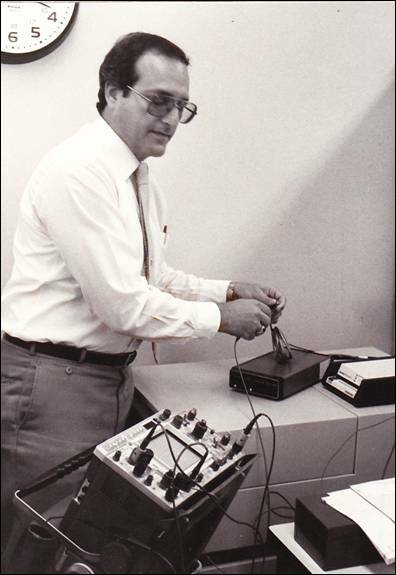 All of the interface engineering mentioned in that Altair Computer Notes article was performed by Ronald P. Boley, Barry's good friend and an early adopter of personal computers. They had met at an electronic peripheral tradeshow in Long Island, when Ron was an Electrical Engineer at Hansen Associates, a HoHoKus, NJ, manufacturers representative for Remex optical punched paper tape readers and other products. Both of them were into these new personal computers as hobby enthusiasts and for Barry as a business user. They tried many of the (then) not-quite-an-appliance personal computers and accessories. When Ed Robert's buss was appropriated to the early S-100 card cages, they built a couple but were having buss termination issues that convinced Ron the world needed a microcomputer on a single-board. Instead of a garage, they stayed up nights in the back room of Art Hansen's offices and Ron designed the wire-wrapped prototype of what was to become the Barron Technical Products BTP425450/1 single-board microcomputer. It was designed around the Zilog Z80-A and had 48K dynamic RAM, 16K of ROM/EPROM, a multi-floppy disc controller, a CRT controller, two serial and four parallel ports with on-board PROM and a 128-character set. All one had to do was add a power supply, a keyboard, a dumb CRT and whichever accessories fit the task at hand. The BTP425450/1 "spoke" CP/M (Control Program/Microcomputer) in February 1978. 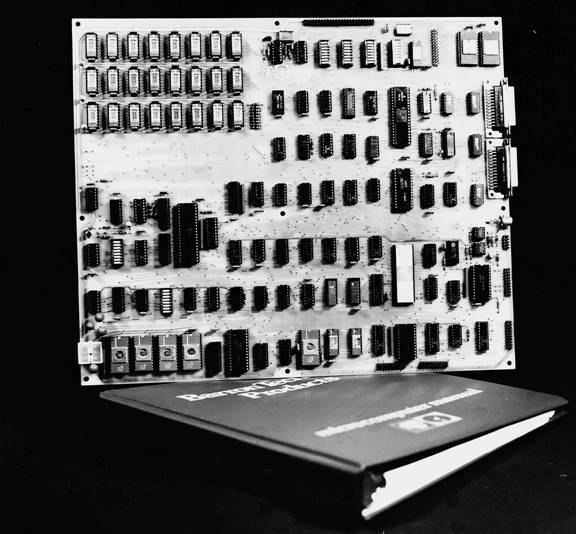 Figure D: Barron Technical Products' BTP425450/1 Single-Board Microcomputer and Documentation binder, circa 1978-79. 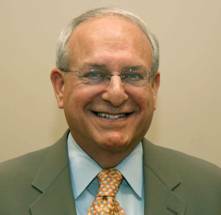 Ron Boley: Barron Technical Products was incorporated on May 16, 1978. Ron had a CPU/Memory/Floppy up and running mid-Summer 1977. We then discussed flushing it out so that it would be a true single-board microcomputer. Ron added the CRT controller and more I/O so we could access paper tape readers, printers, go to a typesetter, interface to keyboard(s), etc. 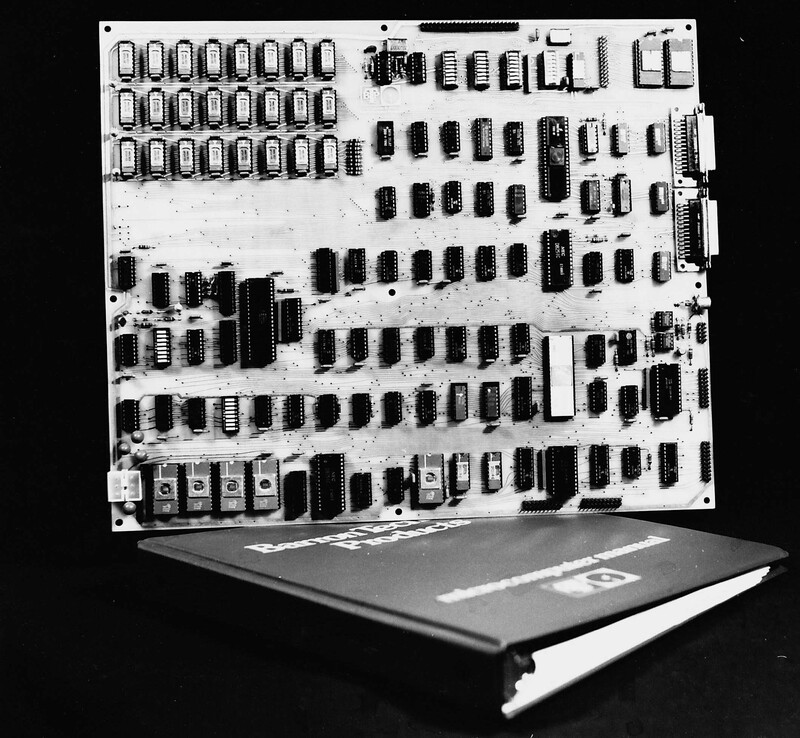 We picked up first revision PC boards in late July 1978 and had a second revision 2-3 months later. Ron spent a lot of time getting the graphic character set just right so this would be a quality product. Barry wanted true descenders on all the lower case letters and Ron did some interesting engineering to make that happen. He used a separate EPROM to hold the character set so that it could be customized by OEM's. Ron remembers that we knew the EPROM was light sensitive and he tried using a lens to see if he could focus light directly onto the EPROM's die and be able to render an image on the CRT screen. We were able to get it to modulate the light but we never got a very good picture due to the internal architecture of the EPROM. There could have been an on-board camera! From a quality perspective Ron designed the Dynamic Memory Subsystem (DRAM) with a delay line so we would not have any of the memory issues that so plagued the MITS DRAM boards, notoriously flaky. Ron also designed a very good data separator for the floppy subsystem so the BTP board would read floppy disks from many sources and systems. 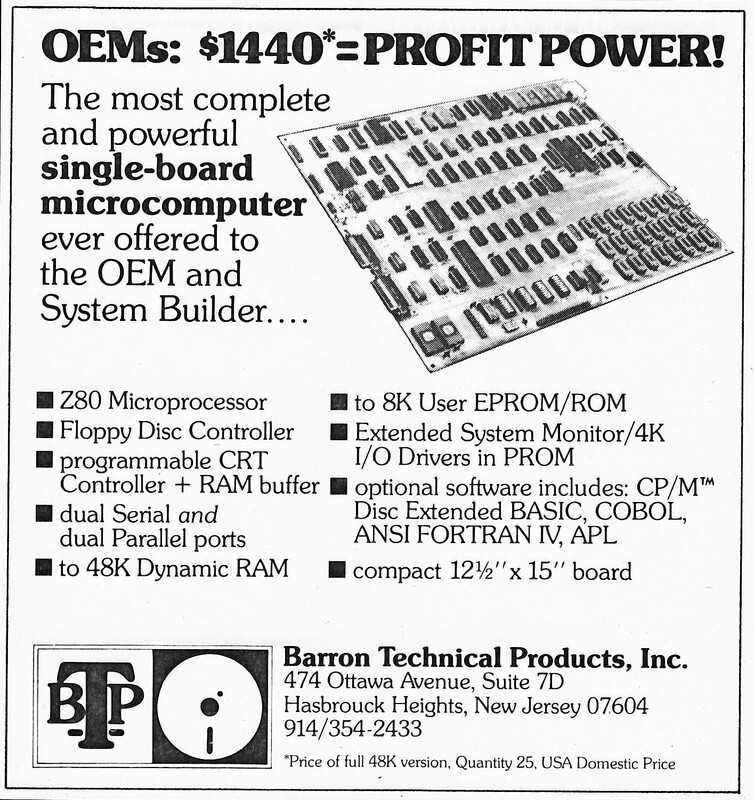 Figure E: Barron Technical Products' BTP425450/1 Single-Board Microcomputer "glamour shot"
On the upper corner of the board, near the floppy connector, Ron added another connector that could take a ROM/EPROM plug-in software module. He thinks that idea came from the HP Laser printers that had plug-in font sets that were sold at great profit. We could populate the area with sockets and embed the software or leave it empty for a slide-in cartridge. An embedded version of Basic or other OEM application was our goal. Both the original and a second generation BTP board are operational to this day. All of the BTP software was housed on floppy disks dating back to 1977. Floppies were never intended as a long term archive and we wanted to keep our work safe. Ron, ever the tinkerer, added an IDE interface to the second generation board, wrote the CBIOS and archived all of our software onto hard drives. Ron still has the large (3.5' x 3') PC board film masters that circuit board layout master Bob Bask did for BTP. Ron can't remember the timing but he thinks we were the first to produce an integrated Z80 system on a single board. We also documented and published our BIOS (Basic I/O Subsystem). 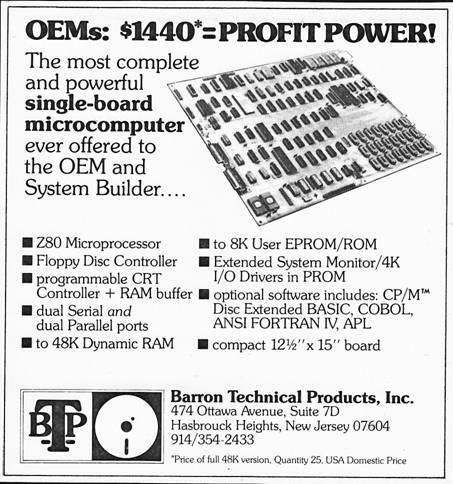 Barry: We found, when we ran the New York Times advertisement pictured here, that we were ahead of the curve with this single-board product when we attempted to sell it into the OEM marketplace in New York. Entrepreneurs in Manhattan and Westchester County, NY, had all kinds of ideas for the incorporation of our board into their future products - but they were not ready to order! Or, that we were not financially substantial enough to even license the artwork to a company like Honeywell - although our design did everthing they needed for a particular project, we could not qualify as vendors despite the fact they were going to build the assemblies themselves. Catch-22. David Bunnell: Fast forward to 1985 and I was lucky to be in a position as head of a publishing company to buy the very first completely desktop published magazine from Tony Bove and his partner, Cheryl Rhoades. The magazine was aptly named, "Desktop Publishing" which we shortened to just "Publish!". And yes, it was entirely produced on the Macintosh computer. I banned glue pots from the production department around this time though I've since learned they had a couple hidden away for emergencies. (c) 2009 Barry J. Yarkon, New York. All rights reserved.